I met Joseph at the Space Café, a little tourist place that had great food. I was excited to tell him that I had “slept on it” and had an answer for him. The out door setting was secluded and romantic. We found a corner table with comfortable whicker chairs and sat down and ordered a milk shake and samosa. “I’ve been thinking about what we talked about the other night,” I told him. “And I think I’m ready to take a step forward. I think we should get engaged.” I don’t know what I expected from him but the huge smile and the bear hug that I was soon engulfed in took me by surprise. I laughed and moved over to sit on his lap. We sat that way unaware of anyone else and just talked through our plans. “This isn’t official though until you propose properly with a ring and everything,” I told him. “And you have to make it a good story. I’ve waited a long time to be proposed to and I’ve always wanted a good story. If you need help, coming up with something I can give you my friends phone number and she can help,” I told him, feeling quite sure that he wouldn’t have the first idea where to start to plan the kind of outrageous proposal that would live up to all my day dreams of how that moment should go. He insisted that he could do this on his own and that he didn’t need help, he could make it special and romantic. “One more thing,” I added, “about the ring, I kind of know exactly what I like and what I don’t like. But I want you to pick it and I want it to be a surprise…so I could maybe show you some pictures and then you would know what to look for…” I told him. He assured me he would work something out. We talked then about our plans, we would start the fiancée visa application right away, and then when August arrived and I headed home I could start planning the wedding. He would join me as soon as possible and we would be sealed in the Salt Lake Temple. We called the temple and set the date. October 11th. It seemed everything was falling right into place. Our evening was perfect. A few days later he called to ask me if I could go look at rings with him. I thought we would just look to give him an idea of what I liked, but when we got there, there wasn’t much of a variety to choose from and we quickly found one that suited our purposes. And since it really was the only option as far as I was concerned, we bought it there on the spot. The cashier put it in the little velvet box and handed it to Joseph. He handed it to me, You keep this for now he told me and make sure you bring it with you when we take our trip to Rwanda. We were planning a trip to visit Rwanda that weekend. I laughed a little. It was a bit un conventional and not at all what I had in mind but, what did it matter now. I begged Joseph to let me wear the ring for just a little while. 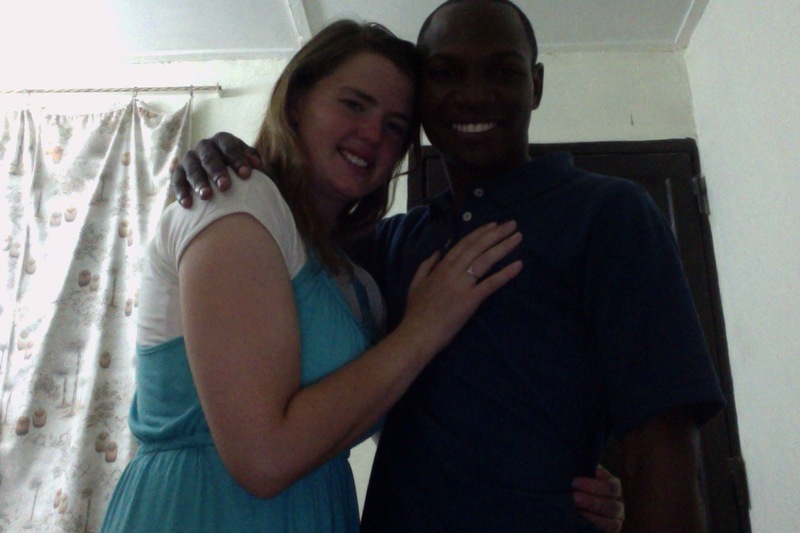 He agreed and we had lunch and then headed back to Jinja. Finally the weekend arrived. I wondered what Joseph had planned, as I packed the ring in my bag. I hoped it would be good. In the taxi on the way to the bus station, I talked to Joseph about something that had concerned me. I was very open about my concerns, never realizing that it might look to him as though I was questioning our decision to marry. Somehow it ended up in an argument. Both of us were very emotional and I felt he wasn’t listening to me and being understanding. I have no idea what he felt but when I looked over at him, he had tears in his eyes as they looked straight ahead, he didn’t seem to want to look at me. I was frustrated and didn’t know what to do. I had told him of my concerns because I wanted him to comfort me, not the other way around! 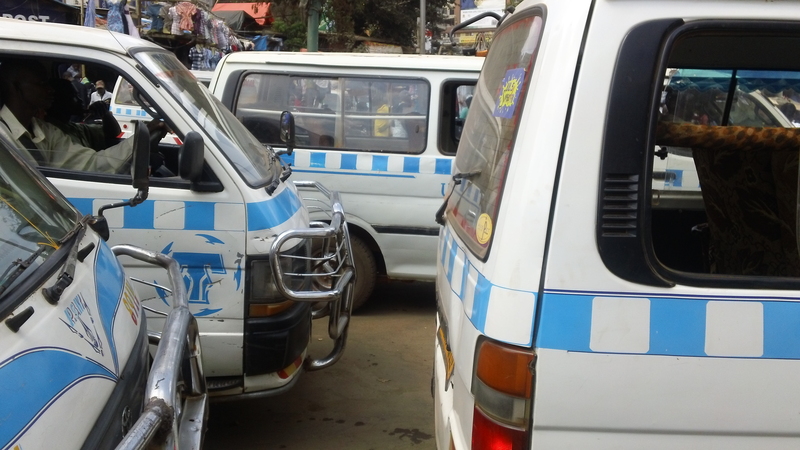 The taxi was stuck in the bumper to bumper traffic like nothing you will see anywhere except Kampala streets and as the minutes turned to hours we knew we were about to miss our bus if we didn’t do something quick. Finishing this conversation would have to wait. We exited the taxi and found a couple of boda boda drivers. We need to get to the bus station Joseph told them and we need to make it in 20 minutes no matter what. Can you take us there. They spoke among themselves for a few seconds questioning if what we asked was possible. Ok they told us we can take you but hang on tight and don’t let go for anything, we will not be stopping if we are going to take you. In order to make what we had planned possible we would take two separate bodas. Normally the drivers wanted you to hang on to the bike and not them but this time the driver told me to put my arms tight around his waist and get ready. We zoomed in and out of traffic sometimes coming so close to the cars on either side that I worried that my feet would hit them as we passed. When the cars closed up around us the driver whipped up over the curb and took the sidewalk, sometimes using his feet to help balance and sometimes using his hands on passing cars as we squeezed through small spaces. I clung to him for dear life and tried to keep an eye on Joseph’s back just ahead. In almost exactly twenty minutes we whizzed into the parking lot where our bus stood waiting. It was dark outside and the lights where on inside the bus, we could see that most of the passengers where already seated. I grabbed our things paid the boda men and raced up into the bus. It wasn’t until we were safely in our seats and the bus was on its way that Joseph chose to resume our discussion from before. This time however, everything was different. 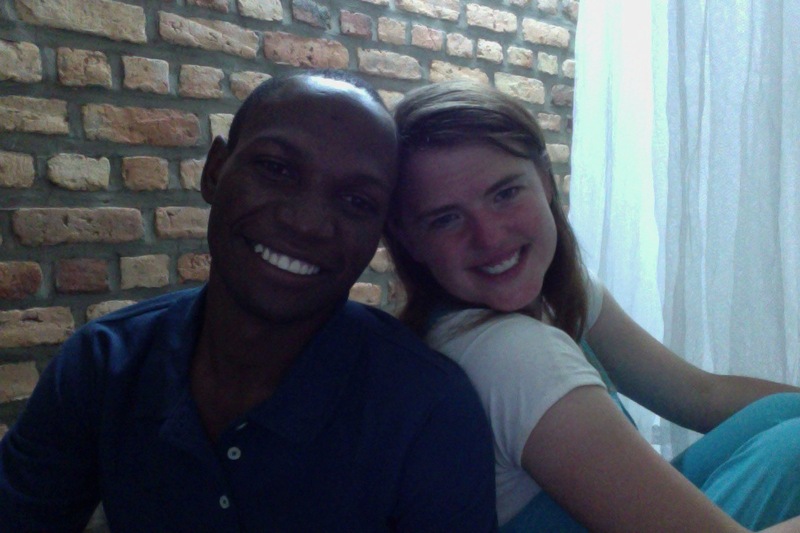 We were seated in our two chairs side by side in the dark bus as it rumbled along down dirt roads, our chairs reclined just a little to allow us to sleep as the trip to Rwanda was going to take all night. Joseph raised the arm rest between our two seats to allow us to be closer and then he put both arms around me and cradled my head on his chest. “Im sorry, he whispered to me, There is just nothing that frightens me like the thought of losing you. Hearing you talk like that made me think that you might go home and I would never see you again..
Tears streamed down my cheeks. “I love you Joseph, I said, I would never leave you. I just wanted to be able to share with you some things that were hard for me. I wanted to hear you reassure me that it was all going to be ok. That’s all I really wanted.” His hand stroked my hair and down my back as we whispered lovingly to each other until we both fell asleep. We had survived our first fight. 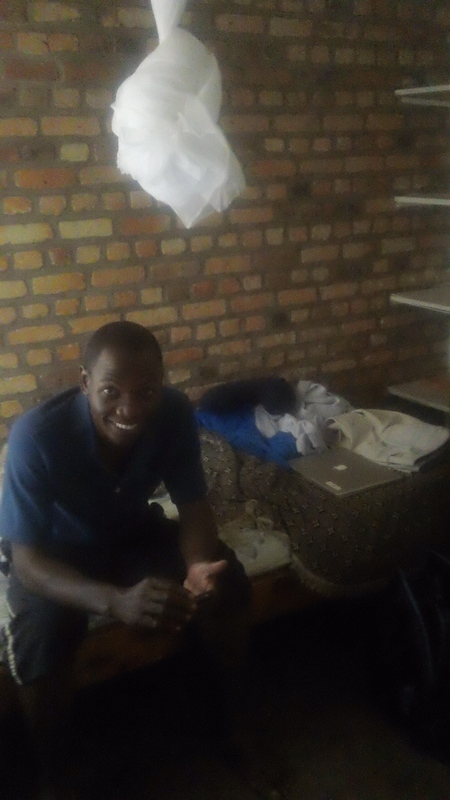 Morning arrived, although it was still dark outside and for the first time since I had come to Uganda, it was cold. Joseph informed me that we were very near the border, in a place called Kabale, It was here that we would be required to get off the bus and cross the border on foot. We exited the bus, I wrapped up in my blanket to try to keep from shivering, As we stood in line to declare our possesions and obtain permission to pass into Rwanda we snacked a little on Mendoza ( a type of deep fried bread) and Fanta. Finally we finished the requirements to enter the city, changed some Uganda Schillings into Rwanda Francs and walked across the border to reboard our bus. As we continued our journey the sun slowely came up to reveal the beautiful country side, that one pictures when they imagine going to Africa. The red sand, open saces, and funny little trees off in the distance kept me captivated. I marveled abit at how I had come to be here. I had always wanted to live a life of adventure but I never imagined I would be sitting on a bus watching the sunrise as I entered Rwanda with my future husband by my side. I felt like I was living in some kind of dream. I struggled to wake from this dream and realize that it was in fact reality so that I could soak it all in, enjoy every second of this magical journey that had surpassed all my imaginings.. 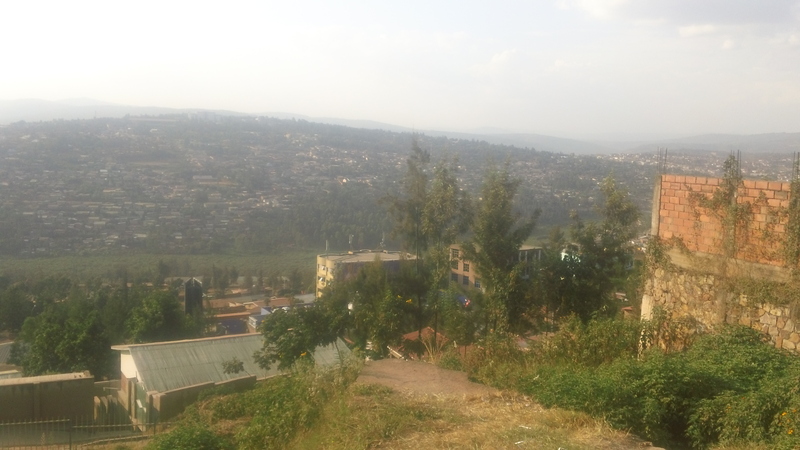 Finally we reached Kigali, the capital city of Rwanda. It was so interesting to know the recent history of this place and yet to find myself here. Where stories that I had only read about took place, seeing and being greeted by adults who no doubt had been present, a witness to, if not a participant in the genocide that took place there. We took a taxi to a hotel, paid for our rooms and settled in to look around. Our room…two rooms really, separated by a half wall. Each room with a small cot against one wall and one room with a sink attached to the other wall. A small table sat in the room that would be Joseph’s. Joseph, on his side of the room. We unloaded our belongings and headed out to get some breakfast. We stopped on our way at an ATM only to discover that it wouldn’t take a visa so we went in search of another that would. We tried another and when it wouldn’t either we decided to just head to the mall to get something to eat and we would find a place to change more money later. I stuffed my small coin purse with all of our cash and my credit cards back in the backpack that Joseph carried on his back and we headed to the mall. When we arrived I reached in expecting to feel the coarseness of the bark cloth coin purse only to feel nothing. We put the back pack down and searched every possible pocket taking everything out of it in our desperate search. I was near tears realizing that more than likely it was really gone. We retraced our steps back to the last ATM homing against hope that we would find it along the way, but the purse was gone. We better report it to the police, Joseph told me, see if they can help us. I was near tears, not sure what we were going to do without that money and completely at a loss for how I was going to survive the rest of my time in Uganda without access to any of the money in my bank account. Assuming of course that whoever took our purse didn’t get everything out of it before I could call and cancel the card. I was frantic, Joseph and I stood looking at each other, just inside the mall entrance. I didn’t know what to say to him, I was a little afraid that he would be start blaming me for not putting the purse in a pocket that had a zipper as I now realize that I should have done. I looked at him, he looked at me and then he started to grin. Joseph this isn’t funny I said, this is really serious. We have nothing! And no way to get home until the bus leaves in another three days! We will be ok, he told me, and think of the stories we will have to tell our grandkids. I looked at him not sure if I should be angry with him for not taking this situation more seriously or to hug him for being such a good sport about it all and for reminding me of something that I should have remembered. This was just another adventure, and if nothing else it would make a good story later. I knew from past experience that often when things go horribly wrong, the make the best of memories years down the road when you can laugh at the craziness. “You’re right I said, we will be fine. It might even be fun. I said with a twinkle in my eye. It won’t be the trip we planned but Im quite certain it will be an adventure. He hugged me then and we sat down to assess our situation. Just then a couple walked by, obviously tourists as they were white and spoke with an Australian accent. They had twin daughters, one of which was in her mothers arms and the other was trailing behind the couple. She looked at us and without a word walked straight to Joseph and lifted her arms to be picked up. Joseph stood unsure of what to do. Her little face, framed by blond curls, looked up at him, her blue eyes so peaceful and sweet demanding his attention. He picked her up and walked toward her mother who stood watching, looking slightly unseasy. When Joseph reached the mother he held the girl out to her only to have her little arms wrap tenderly around his neck and she turned her face to hide in his shoulder. He spoke to her for a minute and encouraged her to go to her mother. She finally did while her twin looked on quietly sucking her thumb. I stood watching the whole scene in amazement. To me Joseph shone with kindness, his smile radiated goodness and I saw it from the moment that I met him. To see this child react to that confirmed to me that President Jackson’s words to me that day at the wedding were more true than even I imagined. Joseph really was everything that I thought he was. Even a child could see that and loved him. I imagined him holding our child in his arms. After the little family left we gathered up all the loose change and any bills of any kind that we had on us. We changed them into francs and discovered that we had just enough left to take a taxi back to the bus station with a little extra. We went to the grocery store to see what we could find. We bought a loaf of bread, a jar of peanut butter, a knife and a carton of milk. It wasn’t much but at least we wouldn’t starve. It was a holiday so most places where closed, and Joseph and I were unable to report our stolen wallet to the police as the station was desereted. We went back to our rooms and sat on the bed. We read to each other and talked for sometime. Later that evening, we sat talking and Jospeh asked me if I knew what day it was. I did. It was the fourth of July. I knew everyone back home would be celebrating with fireworks and good food. But I was happy right where I was with my peanut butter sandwhich. My bed, in our fancy hotel! Did you bring that thing I asked you to pack? Joseph asked, referring to my engagement ring. I laughed knowing what was coming. I did, I told him. Well we are going to need it now, he told me. I scooted off the bed and went to my side of the room to get the little black velvet box, this was so inconventional and so not what I had imagined. I brought it back and gave it to him. Ever since I got home from my mission, I have been praying and looking for a girl that would commit herself to me and to the gospel, he told me. I wanted to find a girl that I could trust to raise our children in the church, to have family home evening with me, and who would support me in my callings, he told me. When I met you I was amazed by your goodness and I knew without a doubt that you would make a great mother, the more I got to know you I saw that you were committed to the gospel. I have told you some of the reason’s why I love you. He said, but the biggest reason I love you is because it is so clear to me that you love the Lord. He promised to send me a handmaiden of the Lord and when I look at you, that is what I see. Joseph, I interrupted, knowing what was coming and knowing that it couldn’t happen with both of us seated on his bed. Joseph, you know you can’t do this sitting down right? I asked not sure if he knew that he should be down on one knee. Joseph, I enterupted again, you know you can’t do this standing up right? He looked at me confused. You have to get down on one knee. I told him laughing a little at how this was all turning out. No problem! I will get down on two knees, he told me and he started to get down on the hard concrete floor. No Joseph, Ilaughed again, its done on one. In America when you propose you get down on ONE knee. He seemed confused at why two wouldn’t be better but he did as I asked. Finally he finished, look around you Vilate, this room, this place is nothing fancy, this trip is probably going to be a little bit hard. We don’t even have anything to celebrate with except more peanut butter sandwhiches. Our life will probably be something like this, full of unexpected adventures, difficult times and trials, but I love you and I promise you that if you will marry me I will do everything within my power to make you happy and to be a good husband and father. 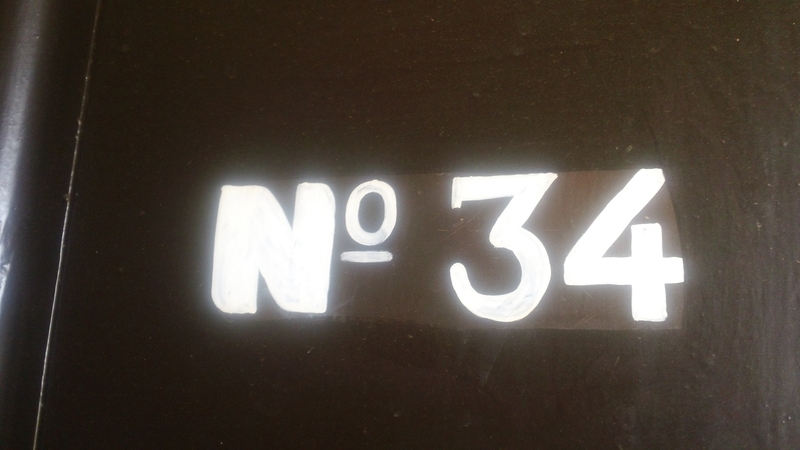 Our room number…I didn’t want to forget anything about that day. I gulped, still trying to grasp at the reality of this moment that I had waited almost 32 long years to experience. Nothing was the way I had imagined it. I looked around me at the cold bare walls, at the hard floor and the dirty sink in the corner and I realized that his proposal couldn’t have been more perfect, that he and I couldn’t have been more perfect. It would never have done to have him show up with roses and a cute little proposal, that just wasn’t me, or him. What could have been more appropriate than the way this had all happened. I said “yes” and Joseph slipped the ring on my finger. I also had imagined that I would be a bucket of tears, that my hand would shake as he put the ring on my finger and that I would be so overcome with emotion that I wouldn’t hardly be able to stammer a yes. I felt none of those things. I felt peaceful, it felt normal, and I was happy. Over the last 16 years or so I had imagined every possible scenario in which this moment would happen. I never once imagined this one and once again life managed to throw me a surprise, an adventure and a curve that I never could have seen coming. Once again life had proved unpredicatable,… just the way I liked it. And yes…neither of us even noticed that the ring was on the wrong hand! 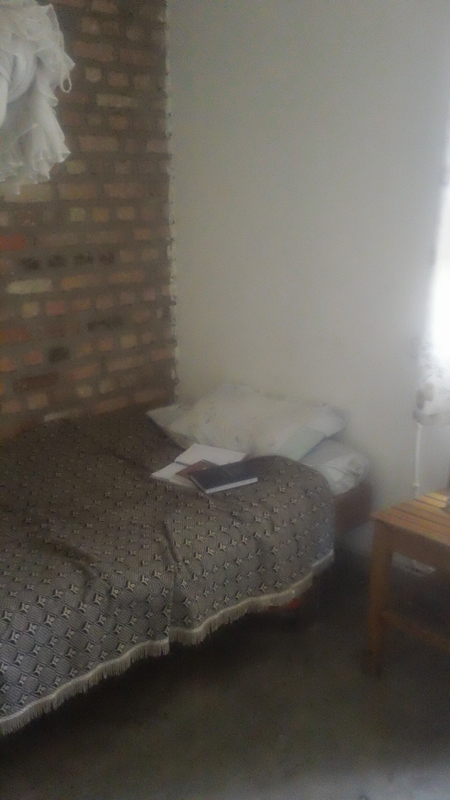 This entry was posted in Dating, Family, Inspiration, My Whirlwind Romance, Relationships, Storytelling, Travel and tagged Expectations, First Fight, Kabale, Kampala Traffic, Kigali, Proposal, Rwanda. Love love love this post!!!!!!!! !